The 2017 edition of the Consumer Conditions Scoreboard shows that more and more EU consumers are shopping online and that their trust in e-commerce has increased, in particular in buying online from other EU countries. For retailers, however, the Scoreboard shows that many are still reluctant to expand their online activities and continue to have concerns about selling online to consumers in other EU countries. Such concerns are mainly linked to a higher risk of fraud and non-payment in cross-border sales, different tax regulations, differences in national contract law and in consumer protection rules. While consumer conditions have improved overall since the last Scoreboard, the levels of trust, knowledge and protection still vary greatly between EU Member States. Commissioner Jourová said: "My priority has been to improve trust of the people and smaller retailers in the Digital Single Market. Consumers are now more confident when they shop online. And we've equipped them with a quick procedure to get their money back if something goes wrong, even when buying from another country. The challenge now is to encourage more businesses to respond to this growing demand." The Scoreboard shows that consumer trust in e-commerce has dramatically increased. 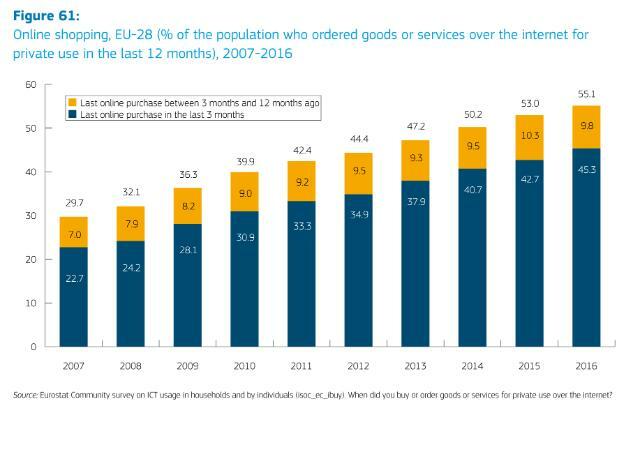 In ten years the share of Europeans buying online has almost doubled (from 29.7% in 2007 to 55% in 2017). Since the last Scoreboard consumers' levels of trust have increased by 12 percentage points for purchases from retailers located in the same country and by 21 percentage points for purchases from other EU Member States. Although there has been much progress, the Scoreboard shows that consumers are still facing obstacles when trying to buy from online retailers based in another EU country. For example, 13% of respondents reported a payment being refused and 10% were refused delivery of products to their country. As for retailers, only 4 out of 10 of those currently selling online said that they are considering selling both domestically and across borders in the coming year. Many still have concerns about selling online in other countries, namely because of a higher risk of fraud, differences in national tax regulations or national contract law rules, or differences in consumer rules. This is why the Commission has made a proposal for modern digital contract rules to harmonise contract rules for online sales of goods, and to promote access to digital content and online sales across the EU. Compared to the previous edition of the Scoreboard, consumers are more aware of their rights. On average, 13% of consumers are aware of their key rights (an increase of 3.6 percentage points since 2014). However, consumer conditions are generally better in northern and western EU countries than eastern and southern ones. 94.5% of Finns complain when they encounter a problem, for example, whereas only 55.6% of Bulgarians do so. Exposure to unfair commercial practices, such as the use of aggressive marketing techniques, also varies greatly: 40.9% of Croatians are affected, in comparison to 3.4% of Austrians. To tackle these issues, the Commission is working on a proposal to update consumer rules. The aim is to make sure that every European consumer is aware of their rights and that these rights are correctly enforced throughout the EU. The 2017 Scoreboard shows that retailers' knowledge of consumer rules hasn't improved since the previous edition. Only 53.5 % of their answers to questions on basic consumer rights were correct. Again the level of knowledge varies between countries, with only 36.2% of Croatian retailers knowing these rights compared to 62.3% of retailers in Germany. While consumers are finding fewer reasons to complain, the ones who have done so are more satisfied with how their complaints are handled. However, almost one third of consumers decided not to complain, as they considered the sums involved were too small (34.6%) or that the procedure would have taken too long (32.5%). This is why the Commission has improved the Small Claims procedure (since 14/07/2017), which now allows consumers to benefit from a fast-track online procedure for claims up to €5,000. The Commission is also encouraging out-of-court settlements with the Online Dispute Resolution (ODR) platform, which offers easy online access to alternative dispute entities for online transactions. The Consumer Scoreboards provide an overview of how the Single Market works for EU consumers. Published since 2008, they aim to ensure better monitoring of consumer rights and provide evidence to inform policy. The Consumer Conditions Scoreboard, which monitors national conditions for consumers in three areas: 1. knowledge and trust, 2. compliance and enforcement, 3. complaints and dispute resolution. It also examines progress in the integration of the EU retail market and in e-commerce. The Consumer Markets Scoreboard, which tracks the performance of over 40 consumer markets on the basis of key indicators such as trusting that sellers comply with consumer protection rules, the comparability of offers, the choice available in the market, the extent to which consumer expectations are met, and the detriment caused by problems that consumers encounter. Other indicators, such as switching and prices, are also monitored and analysed (2016 edition).